Physicist Klaus Heinz and his son, mastering engineer and musicologist Dr. Frederik Knop founded HEDD Heinz Electrodynamic Designs in October 2015. Heinz is the founder of several renowned companies, among them loudspeaker manufacturer ADAM Audio. For the past forty years, Klaus Heinz has dedicated himself to developing high-end loudspeakers that have become established constants in diverse fields: from music production processes in professional recording and mastering studios to radio broadcasting, installation and finally home HiFi, his loudspeakers can be found in a great variety of contexts. Despite their application in diverse tonal and professional contexts, Heinz’ loudspeaker designs have always stayed true to the same ideal of sonic excellence: they have, above all, always aimed to produce complete accuracy and outstanding signal fidelity while being less concerned with tinging recording audio material with pleasing tonal colors. 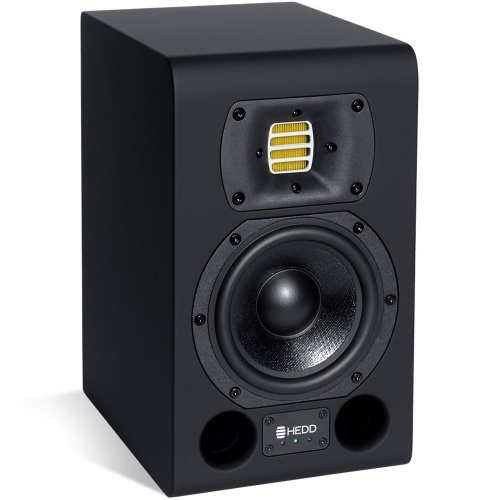 It comes, therefore, as no surprise that the product development department at HEDD | Heinz Electrodynamic Designs is fully committed to the idea of creating versatile and surgically precise studio monitors that producers and sound engineers from a wide array of musical branches can use as tools for their audio monitoring processes. HEDD’s loudspeakers can thus be understood as the newest and most advanced products that Klaus Heinz and his team have developed over the years. Not only are HEDD’s loudspeakers produced in Berlin, they also feature an unprecedented level of digital signal optimization (HEDD Lineariser®) and connectivity (HEDD Bridge), improved diaphragm materials as well as ultra-efficient amplifiers. Last but not least, these brand-new studio monitors take another technological step in the development of the Air Motion Transformer. Years ago, Heinz revolutionized the professional world of audio production by introducing his first Air Motion Transformer. Today, AMT systems are used wherever an extremely precise and vivid reproduction of high frequency material is called for. We are an authorised dealer for HEDD please browse below to view all of our HEDD products. Analogue studio monitors made with extreme precision.